Danielle Ellis never liked it when people stared at her, but she loved when they approached her and asked questions, especially when it was curious kids whose interest she had piqued. The conversation starter — or in some cases the reason for the long glances — was the fact Ellis has a prosthetic leg. “I always found that adults would more often sit there and stare, which for me when I was growing up, was frustrating,” she explained. “I had always accepted my disability and I didn’t mind if people asked me what happened. It’s my story and I am doing great for myself — I have a job and a career and finished school and all this stuff,” she added. And Ellis, who turns 25 in November, is doing something great: suiting up for Canada next week at the Paralympic Games (Sept. 7 to 16) in Rio de Janeiro as part of the women’s sitting volleyball team. “Amazing is such a little word; it is exhilarating,” she explained. Ellis was less than two months old when doctors had to amputate her right leg below the knee. When she was two weeks old, her parents had discovered a lump on her right foot, no bigger than a quarter. She was diagnosed with rhabdomyosarcoma, a cancer of either soft tissue, connective tissue or bone. “People always ask me my story and I say it is my parents’ story. I didn’t really go through much of it,” Ellis explained. This was nearly 25 years ago. “I remember always knowing that I had cancer. I was in the hospital for about a year, year and a half, going through chemo,” Ellis said. She also remembers going for yearly check-ups at B.C. Children’s Hospital until she was 16. But her South Surrey childhood was no different than any other kid and sports were always a big part of it. She did gymnastics, and then baseball, soccer and volleyball, always competing against able-bodied athletes. It was at a volleyball camp in 2007 when she first learned about sitting volleyball. Sitting volleyball was different from what Ellis was used to, especially since she loved running around, whether on the volleyball court or on the soccer pitch. “I definitely missed that aspect, but the more I played, the more the game evolved so it was really great to learn something new and I did fall in love with it,” she said. This led to an opportunity to join the national women’s team program in 2008. 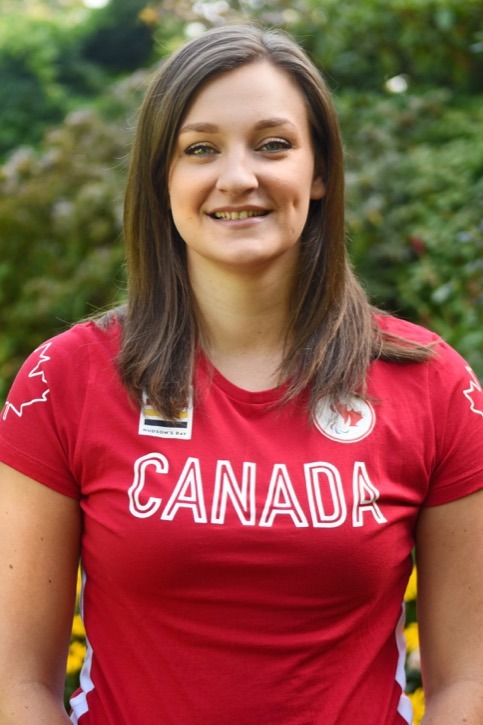 And after graduating from Semiahmoo Secondary in 2009, Ellis put her studies on hold to move to Edmonton and train full-time — while taking post-secondary classes online — in an effort to help Canada qualify for the 2012 Paralympic Games in London. The team was training six or seven days a week, with multiple workouts on most days. When Canada failed to qualify, Ellis was devastated. “I put my heart into it so when we (failed to qualify), it was pretty difficult for me. I tried to come back to the team but it just wasn’t the same for me,” she said. “When you train all day, every day, and then you get to the competition and don’t succeed in your goals … for me, at that age, I couldn’t accept defeat. Ellis returned home and shifted her focus to her career. Since high school, the goal had been to become a paramedic, so she began working towards her Primary Care Paramedic licence, completing her studies last year. With her focus on her studies, Ellis also turned an opportunity to rejoin the national team last year as Canada prepared for the Parapan Pan Am Games in Toronto since she knew she could not devote the necessary time to properly train while maintaining her coursework. But after Canada finished third in Toronto to qualify for the 2016 Paralympics, Ellis was again invited to try out for the squad and was one of the dozen players named to the roster. Ellis, who moved to Langley three years ago, is one of two Langley women on the roster, alongside Tessa Popoff. The roster was named back in July. Ellis has spent the past few months juggling her time between training for Rio and working full-time as a dispatcher for the B.C. Ambulance Service.